by Horst Ellenberger, of Nuremburg, Germany. It was in May 1997, three weeks after my ditching in the Pacific Ocean and the dramatic rescue, when I began with the preparations for my next journey. Though I had lost my Bonanza 35B I had not lost courage and wanted to try the round the world trip once more. I therefore began studying ads about second-hand prop-jet Bonanzas. Although actually these were too expensive, my desire for more safety outweighed any price considerations, f or statistically there is only one turbine (prop-jet) failure for 26 piston engine failures (naturally even one failure is one too much). And then I found "my" airplane. One of his previous owners was country singer Jimmy Buffet. In August 1997, after hot section inspection I took the US registered aircraft from America via Greenland to Nuremberg, with Eddy McConwell as an instructor and companion. To introduce the first prop-jet Bonanza in Germany, I had to do the US PPL in Heidelberg first and to go through the German qualification procedure at Beech in Augsburg. In autumn 1997 at last I was allowed to fly the D-EVIK for the first time. Its identification has been well considered: as Viktor India Kilo sounds very high pitched on radio I hoped that it would wake me from dozing during a long-range flight. Mr Hillgruber of Aero Dienst Nuremberg found a maintenance shop for me that has been approved for Allison turbines on turboloader airplanes. That was the time I could start with the actual preparations for the 360°, second go. Bob Reiss from San Diego/USA and Professor Dr. Peter Wölfel from Würzburg were the pilots to join the party and we did all plannings about routes and flight directions together. In autumn 1998 we applied for the approval of the big tip tanks, and in January 1999 the airplane was made fit for the long range. First they removed the FCU (fuel control unit) to be inspected by Allied Signal. In March 1999, after repeated inquiries by Jürgen, it was found that the TOT (Turbine Outlet Temperature) instrument had been manipulated. The turbine had 8 cracks at nozzle No. 1 with the result that the turbine had to be removed and to be sent to England where several parts had to be replaced and the compressor unit had to be reworked. Afterwards the turbine was sent back to Germany. During the test flight the generator shaft broke so that a new generator had to be fitted. 50 hours of flight clearance followed. Just a few days before we wanted to start we received the sad news that the Aerostar which was to accompany us from the Marshall Islands to the United States had in the night disappeared from the screens over Thailand. That was quite an emotional stress for my family and me, of course. But in spite of the butterflies in my stomach I continued with my preparations. In order to be sure, I asked my friend Dieter Schmitt about the way he flies through high activity convergence areas: down to approx. 50 m above water and below the clouds. The day we intended to set out was approaching and the airplanes of the round the world pilots were ready for departure at the Nuremberg airport. The first leg was to be Korfu. We set out on 7 May 1999 with enough fuel in the tanks to be up for 8:50 hours. After climbing to minimum en route altitude 16,000 ft we reached the cruising altitude after 50 minutes. The view of the Alps was great. We passed Munich, Innsbruck, Bolzano and Rome. Over Brindisi it became darker and darker, Kerkira 20 NM "out", still at 11,000 ft. They did not allow us to get down. Then a nose dive, another full circle to reduce the altitude and there we were. Our next leg was Luxor in Egypt. Everything went smoothly. The flight duration with our heavy airplanes had been estimated at nearly 7 hours (take-off only at 95 KT, at once level off and gather speed; climb to 300 ft, level off and landing gear retraction; the climb was with a total of 420 HP for 5 minutes with 368 HP to reach the final cruising altitude, which for us was 11,000 ft and was reached after 21 minutes). Only a few clouds, a fine flight with some tailwind. The coast of Egypt was reached via VOR DBA. From there we had intended to take a nearly direct course to Luxor but permissions are only granted those able to fly above 20,000 ft. We therefore had to take the route over New Valley to get to Luxor. Arrival in Luxor after 6:21 hours. We were already expected there by our handling agent with whom we had agreed all handling cost. We stayed in a nice hotel on a small island in the Nile and enjoyed two days in Luxor and its surroundings, with the Valley of the Kings and all the other famous highlights. Unfortunately it is not allowed to take video recordings there. In the meantime our friends Peter Wölfel and Bernd had also arrived by their Bonanza 36. We were very happy to be complete then. The next day the weather looked good, with forecast of little tailwind. But then came trouble: at the airport we were fleeced in spite of all precautions and efforts of our handling agent: they requested 722 US $ for each airplane! The start was good: relatively long taxiing with 90 KT, take off - stall warning - at 3 m in parallel with the runway, 110 KT climb to 300 ft, level off and landing gear retraction. Within 5 minutes we were at 4,500 ft and headed eastward. The big "sandbox" was waiting for us. Seven hours over the Saudi Arabian desert, hardly any settlements or tents, an inhospitable region. Jürgen is relaxing, we will reach Oman in approx. 2 hours. Suddenly I realize that the readings are incorrect. I am gradually loosing power, the speed is dropping, the torque decreases by approx. 5 PSI, N1 decreases by 0.4 %, even fuel flow is a little bit lower. What has happened? Oil temperature which so far was 70 ° is rising to 75 °. All values except fuel flow are getting worse. Should we land? There is only one airport we could reach. I am calling Bob who is flying in front of me. Other than mine, his voice sounds relaxed. Everything is okay, he told me, we were having very high outside temperatures, 14 to 16 °C at FL 110 which meant a density altitude of more than +3,000 ft. "Don't panic, just wait and see," he said. Nevertheless I am still nervous and tense. Finally we reached Muscat. There was much dust in the air. After our touchdown we were hit by temperatures of 38 °C. Later Bob told us that the best altitude at those temperatures was max. 9,000 ft for piston engines and 11,000 ft. for turbine engines. If at that altitude the temperature is higher than +5 °, it makes no sense to go further up because the density altitude will then be too high so that the Bonanza will no longer be optimal in the air with its profile and will begin to "push". In the United States there have been quite a number of helicopter and small turbine accidents at these temperatures, because these engines will no longer produce enough power. We were discussing the advantages and disadvantages of turboloader version prop jets over and over. Although everybody would like to have more power, it's feasibility that counts in the end. The Bonanza is optimal for long range cruises because of its good-natured profile and the structure of its wings which allows to carry the heavy tip tanks. Our next leg was Bombay, Mumbei Airport which in the meantime has been renamed Chhatrapati Shiraji. The Jeppesen weather fax announced high temperatures and little tailwind. It's a week now that we left Nuremberg. Clearance in Muscat takes about one hour so that we can start at about 7:45. It is very hot, like in a sauna. At these temperatures all airplane data get worse. The long climbout to 11,000 ft (approx. 3,500 m) is very hard, but with some short breaks we can do it. At that altitude the temperatures are at an agreeable 12 °. One after the other we are all at 11,500 ft minimum en route altitude. Reaching Bombay we can go down in a long down wind. Again it is very hot and again we have to wait. Then we have to pay 2,500 US$ for three airplanes and two airports. It takes us one and a half hour to get fuel. At least it's cheap: approx. DM 0.30/litre.It takes us 4 hours until we can leave the airport. The next morning we make a sightseeing tour through Bombay. We were deeply shocked by the misery we saw there. The following day we continued our journey. We are at the airport at 8:00 sharp, but the handling agent is not in sight. Did he misunderstand us? Waiting for our flight clearance we dare to film although it is prohibited and when you are caught in the act, you will be put into prison. At last we are allowed to start. Everything below is brown or grey, completely dried up, not exactly suitable for any sort of agriculture. The monsoon rain will be flooding everything. Peter and Bob are far ahead, and after 5:52 hours we land in Calcutta. There are a lot of thunderstorms near the airport. One should really be down at 15:00 local time to evade them. Our handling agent in Bombay has taken a scheduled flight to Calcutta to do the clearance. Then we look forward to reaching our hotel "Host International" which turns out to be a shady hotel where rooms are rented by the hour. We refuse to eat there and only have a beer or coke. Clearance for departure takes approximately one hour. Peter with his piston Bonanza leaves first, followed by Bob. We ask for start up approval and get the routing for 24,000 ft which we do not accept. They try to put us on another route but we haven't got an overflight permission for Bangladesh. We request a VFR flight which they refuse at first. After 10 minutes of discussion they give us the VFR approval and we can leave at last. `Just how on earth did Bob and Peter make it? Are they flying 24,000 ft? Start ".02 UTC and off we went. Then we reach a convergence zone. We slowly rise to 13,500 ft with an outside temperature as at 15,500 ft. so that the turbine power drops considerably. The weather is fine and we decide to have a snack (sardines in olive oil and Dextroenergen and water as a dessert). During preparations for our journey I have lost 8 kg and provided the meals continue to be so "opulent" I will certainly be able to keep my weight down. We curved around some big clouds and reached Phuket after 6:20 hours. Phuket is a marvelous tourist island in southern Thailand, with friendly people and fine food. After our experiences in India, we felt extremely well there. We stayed in a top hotel, the "Club Andaman Beach Resort", which the handling agent Mr Supphawat Tansiri had booked for us. And we really needed a day of rest. We were informed per fax that the flight over Malaysia had been approved and Singapore had granted the landing permission. Steven Lee, our manager of E-T-A Asia Pacific, has arranged everything for our next leg which was to be Singapore. On day 13 of our journey we took a taxi to the airport. Jürgen and I had no problems in getting through the controls. 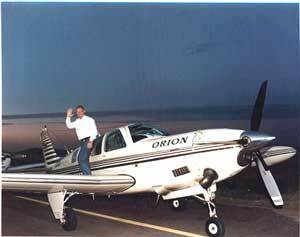 With our pilot's dress, our AOPA Crew card, and the 4 "piston rings" for the shoulder straps everything was okay. Bob, Peter and Bernd who were dressed like tourists were cleared the normal way. Bob was stopped another time when he entered the airplane and it was he who had to pay for the entire handling: 400 US $ per airplane. At last we were allowed to start. We were flying over Malaysia and Kuala Lumpur, over huge clear-cut areas with streets, bare surfaces for new settlements and industrial buildings, a landscape full of scars. The weather was fine again except that there were some clouds when we approached Singapore Seller. It was quite interesting to hear the controller say: "Fly one slee selo." What's that? We asked him: "Fly heading one three zero?" His answer was: "Correct." And then came an instruction I will never forget. Controller: "Make a slight thurn and obit". We were completely at a loss then and asked: "Do you mean, make a right turn and fly a 360°?" (For us that's a full circle). His answer was: "Affirmative." All right then, you live and learn. We now know what's an "obit", the Chinese still have problems in pronouncing the R.
Clearance at the Seller airport was easy and inexpensive, only 8 US $. We immediately went to our hotel. In the evening, after flight plan submission and weather briefing, we were picked up by Steven Lee for my birthday party. We went to an open air seafood restaurant, drank to our health with champagne and delighted in my birthday cake. A downright pleasant evening. Early the following day we went to the airport again. Our next leg was to be Bali-Denpasar. The weather seemed to be fine. I prepared for the long distance over the sea. Departure at 00:45 UTC. As expected, the weather was fine at first. Then we were expected by some showers over the strait between Java and the large island of Madera. There the weather so to speak "grows together". Jürgen had explained it in our weather briefing so it came as no surprise. These were the first three minutes of flying through clouds since we left Nuremberg. Shortly before Bali we went from 13,500 ft down to 8,000 ft so see more of the landscape and then we flew down to Bali-Denpasar. Refilling the airplanes took a very long time. Jet A 1 was filled into a container and a tablet secured to a syringe was hung into the container. The fuel is without water, if it does not turn blue after two minutes. I wet the tablet with some spit and it really turned blue. Another short finger to mouth test: it tasted like fuel so we could use it. At Densapar we were welcomed by Mr Hermann. He is the manager of our subsidiary E-T-A Indonesia in Surabaya. Two of his staff were standing in front of the airport carrying a banner saying "E-T-A Indonesia begrüßt die Weltumflieger!" Day 16 of our journey began with trouble. The turbine power did not seem to be as it should, the climb performance was poor so we would not be able to reach normal altitude. When we had another look on our instruments we saw that the handle for "engine inlet anti ice" was open so that the turbine inlet opening was heated. I closed the handle and the turbine showed normal values. We were quite relieved then. I must have operated the handle when I unlocked the rudder. We were flying under perfect weather conditions and made some formation flying with Peter the same way we had practiced it last year in Augsburg. Australia was approaching. Broome and the Australian coast appeared - a wonderful sight. Approx. 30 minutes before touchdown and again after touchdown the interior of the airplanes were sprayed with a special disinfectant, with all doors and windows closed. Agriculture Control wanted to see our disinfectant before we were allowed to leave our airplanes. Then there was passport control and food control. We were well prepared so we did not have to destroy anything. The Cable Beach Hotel Australia was expecting us. In the afternoon we made the flight preparations for the days to come. There is no tower in Broome so that we had to switch over to Unicom frequency after starting the engines and to communicate with each other. Before we took off an airliner came down, with another to follow. Then at last we could take off heading northward. We took photos and videos and admired the beautiful landscape which is similar to the skerries of Sweden. Later we crossed Hanover Sound. Three hours after we have seen enough and crossed the Kimberly Mountains heading for our next destination El Questro. This resort is sheer luxury in the wilderness and we spent another nice evening together. It was a place to relax and meditate. So my sincere thanks to all who have contributed to this journey, above all to my family who did not urge me after my accident to give up flying. The following day was filled with preparations for the next leg. In the afternoon we made a boat trip into the canyon and admired the 5,000 years old rock paintings. Jürgen called Bill in Melbourne to arrange for our arrival at Archer Field. Bill faxed the latest Australian flight plans and approach maps and we were given instructions how to fly through the National Park: max. 140 KT, flight altitude 2,000 ft. etc. Just by the way we were told that apparently no other pilot from his club in Melbourne had ever crossed this area by airplane. The distance is 1,700 NM, with overnight stay at Ayers Rock. From this aspect we were looked upon as rather exotic persons. We planned to cover the distance by VFR. The heating of the ground produces clear air turbulence there. Day 20 of our journey was the beginning of our Australian adventure. Starting from the unsurfaced runway was quite difficult. When refilling my airplane in Kunuara I dropped a kleenex into the tank which might have clogged the filter. Fortunately enough I succeeded in fishing it out. During our flight we saw a diamond surface mine, then the Bunge Bunge rocks which reminded me of the Yosemite Park in the USA. We flew over wasteland with strange longitudinal barriers as straight as an arrow. Landing at the Ayers Rock airport was again without controller. Our next destination was Brisbane Archer Field. We started at 24° and 64 NM to Kings Canyon and furtheron to our next leg. The whole distance was without radio, with VFR. We flew over military areas, at an altitude between 5,500 and 7,500 ft which had been reserved only for us. We reached Brisbane Archer Field and our friends there without any problems. On our arrival we were welcomed with a great hangar party. At this spot we had covered half the overall distance. We had been in the air for as many as 68 hours. It was time for an inspection of our airplanes. Two mechanics had come to Brisbane for the sole purpose to do this. The D-EVIK got an compressor wash, the fuel nozzle was replaced and the oil pipes were inspected. In addition, the HF antenna was removed from the fuselage to be fitted to the tail unit and the left wing. Bernd and Klaus took the opportunity to make a sightseeing tour through the town in the meantime and visited the zoo because they couldn't possibly leave Australia without seeing a kangaroo. Then came the hour of parting: Bernd Wölfel left us as his journey ended there. The rest of us made an excursion to Frazier Island to visit the world's biggest sand island. The island has got seven different vegetation zones including a tropical rain forest. Frazier Island has been included in the program of world regions worth protecting. We could watch a sea eagle in the air and a dingo on the beach. The dingo is the biggest wild animal on this island. Then we went back to our airplanes. Approaching Hamilton Island we received IFR clearance and went in a descent through clouds (for one minute) down to 1,000 ft, with weather radar as a good help. The islands differ in color and can thus be easily recognized. We realized that the turbine wash has brought us 17 PS plus. It was raining on Hamilton island and I took the time to write as many as 75 postcards. On day 25 of our journey we go on to Horn Island. Bob uses his Inmarsat telephone to get the weather forecast and submits the flight plan. There is a beautiful old travelling clock with manual winder standing in front of him on the table. Concentrating on his work, he realizes by accident only that the clock flies away in the beak of a white cockatoo with a yellow hood. It's damp and oppressive. The lower limits are at approx. 1,500 ft, that's low level flying indeed. Shortly after the start, we fly a left turn by VFR over the islands. Then we go eastward to the Great Barrier Reef and over the small reefs to Cooktown. Again we use VFR to evade the clouds and go straight to Horn Island. It's raining on the ground. There we meet our Australian friends who had organized the entire journey to Papua New Guinea. Our group comprises 15 airplanes which will be en route together for one week. Our next destination is Mt. Hagen on Papua New Guinea. The sightseeing tour through the coffee and tea plantations is extremely interesting. Our guide book tells us that there are 800 different languages spoken on Papua New Guinea. The hotel is fenced up by three barbed wires. We are told to better not go out in the night. We decided to leave although the weather was rather mediocre. Starting took somewhat more time, we had to go around some clouds and then at 11,000 ft we were on top. Unfortunately we couldn't fly through the valleys because the weather was too bad. In Madang we flew along the shore to Long Island. In the middle of this volcano island, at 700 ft, there is a large crater lake. The weather was fine then, the stormscope showed several lightning discharges. Then we went alongshore to Tokua. There we stayed in a resort which was sort of a bungalow camp, quite a luxury for the conditions there. In the morning we made a sightseeing tour in Rabaul. In 1887, Rabaul was the capital of the German colony, after the first world war it became British. In 1994, two third of the city were destroyed by a volcanic eruption. Lava ashes can be seen everywhere there. In the afternoon we decided to drop the tour we had planned, a wise decision because later we learned that the bus had been stopped by trees across the road and four young street robbers equipped with machetes, bows and arrows had demanded money. They had only cleared the way after the people had given them 35 US $. Our next destination was Madang. But first we flew again over Rabaul and the volcano. Then we went on, with fine weather, along the shore to Madang which we approached from the sea. Landing was with down wind. We discussed how to go on, how much fuel we would need for the distances etc. The rest of the day we were relaxing. After a quiet night we went on. Two airliners were cleared before it was our turn. It was very hot, about 38 ° and little wind. We were glad to have some drag after the start and flew along the shore to a still active volcano. It looked rather dangerous so that we took care not to get too close. Looking for a river mouth we saw that many villages were overflooded. At last we realized the grassy runway of Karawari, 900 m long. After a good spot landing we were slithering on the flooded grass. At the end of the runway a tremendous sight: hundreds of dark-skinned native people had come to see the airplanes, some of them had covered distances of 120 km or had reached the runway after a 2 day trip by boat. We took a boat to get to the lodge. After lunch we made an excursion to the next village. The inhabitants showed us how they make pancakes using a certain tree and water from the river. I didn't dare to taste it. It was very hot: 40 °C at 99 % RH. Back in the lodge we had to make a difficult decision - beer or shower first? In the evening the big surprise: a music band from the village we had visited played for us. It was meant as a goodbye for the round the world pilots and I was very touched by the friendliness of these people and our Australian friends. It was an absolute highlight of our journey. I have never lived to see something like this! We took the boat to get back to the airport. I had rained over night and there was 4 cm of water on the runway. How would we manage to take off? We found nothing about such a situation in our manuals. Surprisingly we did not have any problems with the start. After some low overflights we set out to Mt. Hagen to refill our airplanes. Then we went on to Port Moresby and submitted the flight plan for the next day. After these tourist flights we had to mentally prepare for the long range again. In the hotel we met my new copilot Dr. Günter Kuhlmann which had arrived by airliner. 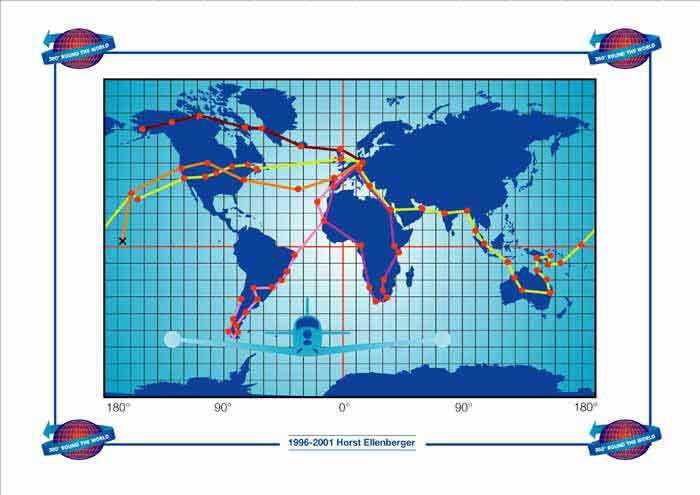 Tuesday, the 8th of June 1999 was the 33rd day of our journey. We said goodbye to Jürgen and my copilot who for business reasons had to return to Germany. From Port Moresby we wished to go to Honiara at about 777 NM. The weather was fine. I still held my personal world record: since I left Nuremberg, I have been in clouds for totally 5 minutes only. Honiara is situated behind the mountains. We began the landing approach in the very last moment and were taxiing to a standstill on the long runway. Our next destination was the Pacific Ocean and the Marshall Islands. There was heavy rainfall when we went to the airport. We waited in the airplane until visibility was good enough for us to start. We had to cover three legs of totally 5,500 NM. With weather radar we were able to find a good way through the clouds; at 7,000 ft we were above the clouds, in relatively good weather. A head wind of 15 knots doesn't make pilots happy at all, but I had taken it into account when calculating the fuel requirement. After 7:51 hours we landed on the Majuro airport. Seen from the air, it was a touching sight: a narrow atoll with the runway and street taking its whole width. I was filming but unfortunately forgot to switch on the camera. That was the island where I had arrived two years ago after my ditching and the rescue through the shore patrol. This time everything went well, the turbine was running smoothly. We were expected on the ground by Klaus, the airport crew who wished to go home. We had to pay overtime. In Majuro we took a day of rest. It was raining, so we went to the airport to refill our airplanes. Our next destination was to be Honolulu. Klaus, the German born airport manager, was early at the airport. We had to require the starting permission by HF radio from San Francisco Center but as I did not know that I was wasting costly fuel for half an hour. Bob had already left when we were finally allowed to start. It was a long flight with fine weather. We obtained much information on how the airplane would perform in this configuration. As we had head wind and slow ground speed our fuel computer indicated that we would not get to Honolulu that way. After two hours the head wind grew weaker so we could breathe again. I filmed the wonderful sunset above the Pacific Ocean. Honolulu could be reached via VHF. We took the ILS to OHR and landed. Customs clearance, agriculture and immigration was no problem as Willy Tashima, our friend in Honolulu (2 x 360 °) had perfectly prepared it. Much to our relief, papers, licences, airworthiness etc. were found in order. Then we were discussing how we would reach the continent (USA). The distance 200 NM longer than the last one, the weather forecast was tailwind. To be on the safe side, we based our calculations on 8 KT head wind, including two hours of reserve. First we went to Hilo/Hawaii by the freeway 3 departure route and then, because of the turbulence , along the islands in the north with stopover in Hana where we would watch a fly-in spot landing competition - a welcome change for us. Before landing in Hilo we circled around an active volcano. In Hilo ther was a very special surprise waiting for me. After refilling, I wanted also to refill oil for the turbine bat in turned out that this sort of oil was not available. What should I do? It was Sturday evening an dI urgently needed one liter of Mobil Jet II oil to fly on. Willy Tashima who had accompanied us to Hilo found the solution. He called a friend who bought the oil at a filling station in Honolulu an dtook it to the flight desk of the neyt airliner to fly to Hilo,. A steward on the airliner then took the oil with him so that I finally had it at 18:00. The night in Huilo was short, we went up at 4:00 h to get to the airport to set out for the long flight to San Diego which allowed us to sleep alternately. Reaching the continent was saw the city gleaming below us and prepared for the landing. We reached San Diego on the 40th day of our journey. It was time for an inspection of my airplane then. In San Diego we had to say goodbye to Bob who would stay there and to Peter who flew on to South America. Günter and I Would take the North Atlantic route. Our first stop was in Amarillo, the place where Tradewind Turbines change the Bonanza 36 into the turbine version. We bought several spares and then, passing some thanderstorms, went on the Wichita, the headquaters of Beech ( Raytheon), where my airplane had been built. There was heavy rainfall in the night. We wanted to start but the suddenly the turbine failed. We called in a mechanic of Raytheon who supposed that it was caused by a wet sparking plug-and he was right. The high air humidity had caused condensed water on the plug so as to prevent ignition. You live and learn. Slight icing made the flight to Chicago very exciting. We therefore climbed to 19,000 ft to get around the clouds. Then weather became fine. Tony Bright, the manager of E-T-A in Chicago, expected us at the airport. Together we went to the office - we were back to reality. The return flight to good old Germany could begin. Backed by tailwind the flight back to Germany was quick and short. From Chicago we went to Quebec for refilling, the further to St. Johan's as 200 ft lower limit. The following day we flew to Shannon/irland an dthe had up to 68 KT tailwind until we reached Nuremberg where my family and my friends from the Aero Club expected us with flowers, congratulations and a glass of champagner to celebrate our 360° jorney. Click here for the story of his INTERRUPTED JOURNEY.